Beetroot is so versatile. I first grew to love boiled beetroot in a salad. No vinegar was needed. I even pilched it from the container in the fridge as a tasty treat. Once my Thermomix arrived, I found new ways to enjoy this vegetable: as a pudding with chocolate both cooked and raw, as hummus, and even served to me as coleslaw. 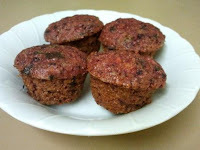 My latest version is beetroot and chocolate mini muffins achieved with minor tweaks to my simplified mini muffins recipe as below. Another difference in this recipe is that I now use spelt flour in my muffin recipes. Of course, the type of flour used is a personal choice.